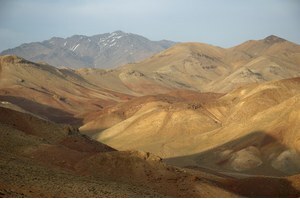 Iranite: Mineral information, data and localities. After the type locality in the country of Iran. 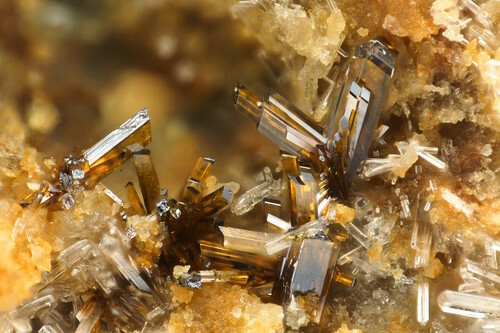 Hemihedrite-Iranite Series. 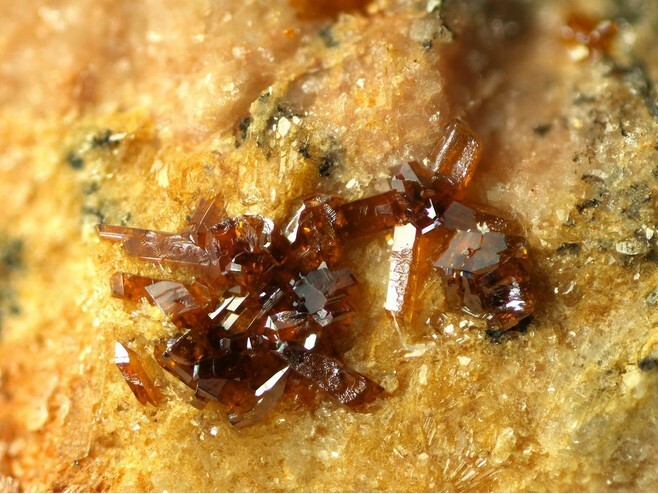 The copper analogue of hemihedrite. Bariand and Poullen (1980) suggest that the type locality is probably not the Sebarz mine as given in Bariand and Herpin (1963), but the Chah-Khouni mine. Wulfenite 11 photos of Iranite associated with Wulfenite on mindat.org. Chromian Wulfenite 6 photos of Iranite associated with Chromian Wulfenite on mindat.org. Phoenicochroite 6 photos of Iranite associated with Phoenicochroite on mindat.org. Mimetite 4 photos of Iranite associated with Mimetite on mindat.org. Galena 4 photos of Iranite associated with Galena on mindat.org. Wickenburgite 4 photos of Iranite associated with Wickenburgite on mindat.org. Polyhalite 3 photos of Iranite associated with Polyhalite on mindat.org. Calcite 3 photos of Iranite associated with Calcite on mindat.org. Fornacite 2 photos of Iranite associated with Fornacite on mindat.org. Hemihedrite 1 photo of Iranite associated with Hemihedrite on mindat.org. 7.FC.20 Cassedanneite Pb5(CrO4)2(VO4)2 · H2O Mon. Bariand, P., Herpin, P. (1963) Une nouvelle espèce minérale: l'iranite, chromate hydraté de plomb. Bulletin de la Société Française de Minéralogie et de Cristallographie: 86: 133-135. Fleischer, M. (1963) New mineral names. American Mineralogist: 48: 1417. Adib, D., Ottemann, J. (1970) Some new lead oxide minerals and murdochite from T. Khuni Mine, Anarak, Iran. Mineralium Deposita: 5: 86-93. Fleischer, M., Pabst, A., Mandarino, J.A., Chao, G.Y., Cabri, L.J. (1976) New mineral names. American Mineralogist: 61: 186. Bariand, P., Poullen, J.F. (1980) Rare chromates from Seh–Changi, Iran. The Mineralogical Record: 11: 293-297. 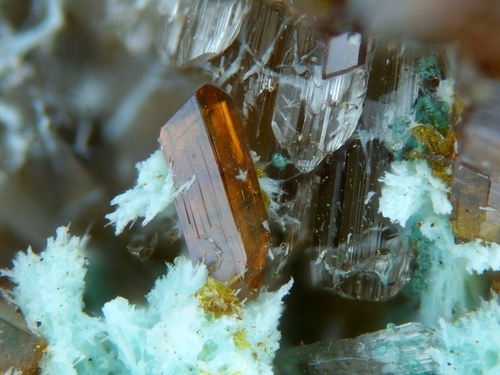 Cesbron, F., Williams, S.A. (1980) Iranite-hémihédrite, bellite, phoenicochroite, vauquelinite et fornacite: synthèse et nouvelles données. Bulletin de la Société française de Minéralogie et de Cristallographie (1980): 103: 469. Frost, R.L. (2004) Raman microscopy of selected chromate minerals. Journal of Raman Spectroscopy: 35: 153-158. Yang, H., Sano, J.L., Eichler, C., Downs, R.T., Costin, G. (2007) Iranite, CuPb10(CrO4)6(SiO4)2(OH)2, isomorphous with hemihedrite. Acta Crystallographica: C63: i122-i124. Peebles F./Ruiz Fuller C.(1988); "Yacimientos Metalíferos de Chile", Fondecyt, Stgo. de Chile. Bariand, P. 1963. Contribution à la minéralogie de l’lran. Bulletin de la Société Française de minéralogie et de cristallographie, 86: 17-64. [Locality description in brief and mineralogical list with photographs] Bariand, P. 2003. Un apercu général sur la Minéralogie de I'Iran. Le Règne Minéral, 54: 41-51. Anthony, J.W., et al (1995), Mineralogy of Arizona, 3rd.ed. : 260. NBMG Spec. Pub. 31 Minerals of Nevada; Robert M. Housley (2005) Recent rare mineral finds in southern California and Nevada desert mines. Abstracts from the 2005 Desert Symposium. California State University, Desert Studies Consortium and LSA Associates, Inc.
ⓘ Silver Hill mine ?